Jeannette Rankin was the first American congresswoman. She was elected to the U.S. House of Representatives in 1916, four years before women were granted the right to vote by the 19th Amendment. Jeannette was born near Missoula, Montana in 1880. She was the oldest of six children and spent much of her young life helping to care for her siblings. She graduated high school in 1898 and went on to earn a bachelor of science from the University of Montana in 1902. She took a job working as a social worker in San Francisco then traveled to New York to attend the New York School of Philanthropy. After this, she attended the University of Washington where she became involved in the women's suffrage movement. In 1911, Jeannette became the first one to speak before the Montana legistlature. She championed women's suffrage and called for a change. By 1914, Montana had granted women the right to vote. In 1916 she ran for one of Montana's two open seats in the House of Representatives. She rallied support across the state and won the seat making her the first woman in Congress. During her first term in Congress, Jeannette had the privilege to vote for the women's suffrage amendment. Because of changes in districts, Jeannette's second term in Congress wouldn't come until 1940. Jeannette was a pacifist and maintained this belief when she voted against a declaration of war on Japan. She said, "As a woman, I can't go to war, and I refuse to send anyone else." She abstained from similar votes for declarations of war that came after this. Her pacifist attitudes during World War II were hugely unpopular and effectively ended her political career. She said she did not regret her choices and maintained that war was not the solution to the world's problems. Jeannette never married or had children. When she died in 1973, she left her entire estate for the aid of "mature, unemployed women workers." 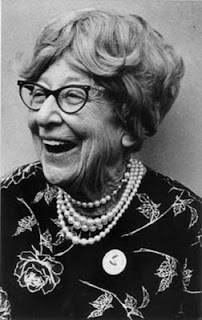 Today, the Jeannette Rankin Women's Scholarship Fund provides educational scholarships to low-income women 35 and older. To date, the fund has awarded more than $1.8 million in scholarships to over 700 women. She is remembered best for her pacifism, but said, "If I am remembered for no other act, I want to be remembered as the only woman who ever voted to give women the right to vote."